Paint Night @ Eastwind Seafood! ​SYLVIA'S ART BAR was created so that everyone would have a place to indulge in the creative process of their choice with a group of warm hearted friends, family and of course...me! ​Most projects run approximately 2-2.5 hours. There is a lot of opportunity for uniqueness with these projects. For example,words and phrases shown on prototype can be changed to your liking and personality. For most projects a varied color palette is also offered. No experience is necessary. No Worries. Just Fun! Looking for a creative experience at home? 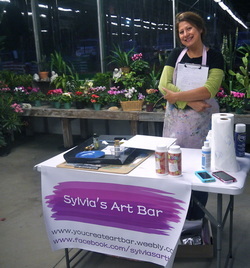 ​Consider hosting Sylvia's Art Bar in your home. just getting friends and neighbors together! All your favorite projects brought to you. ​No Experience Needed. No Worries. Just Fun! Price: Ranges from $40. - $50.00 per person depending on project. ​"One of my favorite activities as an artist is to create among friends. The positive energy that comes from creating in a group is fantastic!"